VíaVienté™ is an entirely new way of thinking about health. It is a singular product for “kids from 1 to 92”. No pills to swallow, no sugar to “help the medicine go down”. Only a positive impact on your health and well-being. VíaVienté™ grew out of the historical appeal of tonics and elixirs using innovation, creativity, and originality. It harnesses the incredible nutritional power of the most famous tonics of the past, passes through the botanical discoveries of our own age of discovery and presses forward to a new level of health and well-being. VíaVienté™ has a marvelous pedigree, its great grandparents include Frankincense and Myrrh, garlic, coffee, and guarana. Its grandparents were Samuel Thompson’s Composition tea, Jason Winter’s tea, Essiak tea, and Swedish bitters, and its parents are standard potency fruit and botanical extracts that we call PhytoNectars™. Life always finds a way to be better and VíaVienté™ is the best of life. VíaVienté™ is the offspring of a unique blend of healing, standard potency whole fruit nectars called “PhytoNectars™”. 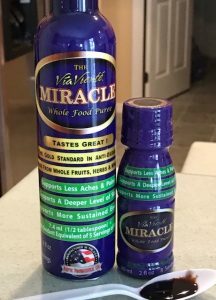 VíaVienté™ contains PhytoNectars™ from whole grapes, prunes, blueberries, bilberries, elderberries, cranberries, noni fruit, whole leaf aloe vera, skullcap root, gentain root, and apples. PhytoNectars™ have many health benefits with broad healing and strengthening power. They make VíaVienté™ a truly world-class tonic. VíaVienté™ provides nutritional support to every part of the body. Grapes for the heart and colon, bilberry for the eye, cranberry for the urinary tract, elderberry for the lung, noni and skullcap for the joints and bowel, prunes for regularity, apples for the constitution, and aloe vera for the skin and digestive system. VíaVienté™’s PhytoNectars™ are made by carefully blending and grinding the finest fruits and herbs in a manner that protects their healing and vitalizing nutrients, making them as bioavailable as possible. Many of VíaVienté™’s PhytoNectars™ are selected from plants that are grown in the Rainforests of South America. Plants that grow near the equator naturally develop greater antioxidant levels to protect their tissues from the rays of the strong equatorial sun. Additionally, VíaVienté contains the pure mineral waters from Equador’s Vilcabamba Valley. The Vilcabamba Valley produces more centenarians per capita than any other population in the world. Many demographers and scientists believe that the unique mineral waters of Vilcabamba play an integral part in the longevity of these people. Each dose of VíaVienté provides the minerals found in one liter of Vilcabamba mineral water. VíaVienté™’s PhytoNectars™ have been chosen for their powerful healing effects. Each of its 11 PhytoNectars™ has been studied by respected scientists, backing up their traditional medicinal uses with credible, peer-reviewed science. Besides choosing and blending the finest PhytoNectars™ in the world, VíaVienté™ does what no other tonic does. It carefully assays each PhytoNectar™ to ensure that each active healthy component has a consistent, standard potency. This means that VíaVienté™, like no other tonic drink, can actually tell you why you look and feel so good when you use it. It also means that VíaVienté™ will give you the same great benefits every time you use it. Tonics have been criticized by the scientific community for their broad unproven claims. Words like “panacea”, and “cure-all” often give false hope to the infirmed and a negative connotation to snake oils and their proprietors. The science behind VíaVienté™ changes this perception. Studies and experience proves its healing, health promoting and constitutional virtues. In a nutshell VíaVienté™ is a vitalizing healing tonic providing nutritional support for the entire body. It is also a Constitutional tonic that protects healthy tissues from the insidious effects of aging. The signs of aging are reduced by powerful colorful antioxidants called anthocyanins that have some of the highest ORAC and HORAC (respected measures of antioxidant potential) ratings possible. The Vilcabamba mineral essence is a trace mineral concentrate that contains 13 mineral chelates and complexes formulated in direct proportion to the waters found in the Vilcabamba Valley of Equador. The 13 minerals in the VME are known to be essential for human health, vital to the function of all the systems of the body. Analyses of the Vilcabamba waters were found to be free of heavy metals including lead, mercury, arsenic and most of the other trace minerals that have been made popular by Dr. Wallach and other purveyors of trace mineral formulations containing 70 or more minerals. The simplicity of the chemistry (purity) of the mineral waters from the Vilcabamba Valley is the one great differentiating factor between it and other trace mineral products. One can speculate that since the citizens of the Vilcabamba Valley consumed less heavy metals over the period of their life, the heavy minerals did not tax the anti-oxidative and elimination systems of their bodies, thus reducing the overall oxidative stress they are exposed to. This may contribute to increased lifespan. Obviously, no one factor would explain the disproportionate number of long-lived individuals in the Vilcabamba Valley. Genetics, climate, and lifestyle as well as the diet and water they consume must all be considered contributing factors to the long lives this people enjoy. VíaVienté™ is manufactured in a cGMP licensed facility. This means that both the facility and the product meets the current Good Manufacturing Practice guidelines along with strict FDA regulations which apply to the manufacture of dietary supplements and foods. Our Quality control chemists ensure that every single ingredient used in VíaVienté™ meet all Label Claims, including Microbiology, and stability tests. We assure you that VíaVienté™ is both safe and effective. The PhytoNectars™ found in VíaVienté™ are grown on the finest farms in the world. We selectively choose plants grown near the equator that naturally contain higher antioxidant levels than plants grown elsewhere in the world. We require each PhytoNectar™ to be accompanied by a Certificate of Analysis (C of A), that meets product specifications for purity, potency, and identity. This information is required for each lot of PhytoNectar™ we receive. VíaVienté™ is serious about its purity and tests each PhytoNectar™ to ensure that it is free of contaminating heavy metals, herbicides, and pesticides. Once a fruit or herb is selected for use in VíaVienté™ it is processed into a PhytoNectar™. Each fruit or herb is carefully washed and dried. Then the whole fruit or herb is carefully ground in a homogenizer that reduces the seeds, skin, pulp and juice into a nectar. The heat generated in this process is carefully controlled to ensure that heat sensitive enzymes and volatile substances are preserved. The pulverized fruit or herb does not become a PhytoNectar™ until it passes a battery of quality tests. Each VíaVienté™ PhytoNectar™ must pass tests for microbiological, heavy metal, herbicide, and pesticide contamination, organoleptic tests, and rigorous active ingredient assays. Finally, to become a PhytoNectar™, it must meet standard potency tests. Each PhytoNectar™ has the same (standard) amount of active constituents. Standard potency allows VíaVienté™ to have consistent dose response. After all 11 PhytoNectars™ are certified, VíaVienté™ is created by carefully blending each of the PhytoNectars™ together and placing the VíaVienté™ blend in its beautiful colored glass bottle. Not only is the VíaVienté™ bottle beautiful, it is also functional. The colored glass helps to ensure the highest potency of the product by protecting it from the harmful ultraviolet radiation of sunlight. As you can see, no aspect of quality has been overlooked, scientific studies prove the beneficial effects of VíaVienté™, Quality control procedures ensure that the product is pure and potent, and cGMP manufacturing techniques provide a consistent, safe product. Grapes provide the substance of perhaps the most important tonic in history. Its beneficial properties are both physical and spiritual. The juice of grapes is used as a ceremonial drink in religious rituals and as a prelude to romance. Grapes are rich in healing and protective nutrients from the tannin family. The protective substances in grapes are so powerful that they can withstand complex fermentation processes. The tannins in grapes are powerful antioxidants to protect the body from the damages of oxidative stress. They also support joint health. Historically, grapes have been processed to remove the seeds and pulp, and often fermented to make an alcoholic drink. Studies show that the seeds, skin and pulp of grapes are among its richest sources of these vitalizing healing and protective nutrients. Only VíaVienté™ uses whole grape PhytoNectar™ processed from grapes grown near the equator, providing the most energizing whole grape PhytoNectar™ possible. In traditional Chinese medicine, baical skullcap (Scutellaria baicalensis) is prescribed for many conditions. The herb is believed to support healthy bowel, joint, cardiovascular and liver function. Scullcap has traditionally been used to relieve aches and pains wherever they are found in the body. Scullcap is also used to relieve the effects of nervous tension, and support immune response and is recommended for occasional insomnia and nervousness. It also helps to support a positive outlook on life. The healing flavonoids in Scullcap possess the unique ability to support joint health and mobility by inhibiting COX-2 production in the body. Scullcap root PhytoNectar™ is made by gently homogenizing it with Vilcabamba mineral water to produce the highest potency PhytoNectar™ possible. Gantain is an ancient bitter tonic. Its has traditionally been used as an apéritif, laxative, and blood purifier. It is a common botanical in many alcoholic bitters. Its active ingredients are called Xanthones. Gentain root contains up to 10 times as much xanthone as Mangosteen fruit (Xango™). Xanthones are chemically similar to the bitter compounds in Aloe, and Cascara sagrada bark. Bilberry, also called huckleberries, and whortleberries, has been used as a traditional medicinal herb since the 16th century. Bilberry has proven use in connection with vascular system and blood support. Bilberry’s fruit contains flavonoids and blue-violet colored anthocyanins, which serve to support capillary strength and flexibility, thin the blood, and support the release of vasodilators. Anthocyanins, a natural antioxidant, also helps support blood pressure levels that are already in the normal range, and supports blood supply to the nervous system. Bilberry also contains glucoquinine that has the ability to help support blood sugar levels that are already in the normal range. The antioxidants in Bilberry along with Vitamins A and C, providing antioxidant protection which can help prevent free radical damage and support eye health. Vitamin A is required for sharp vision, while Vitamin C supports collagen formation, which is needed for growth and repair of tissue cells and blood vessels. Anthocyanidins support and protect collagen structures in the blood vessels of the eyes, assuring strong, healthy capillaries that carry vital nutrients to eye muscles and nerves. Bilberry has long been a remedy for poor vision and “night blindness.” Clinical tests confirm that given orally it supports visual accuracy in healthy people. During World War II, British Royal Air Force pilots ate Bilberry preserves before night missions as an aid to night vision. Bilberry works by supporting the microcirculation and regeneration of retinal purple, a substance required for good eyesight. Bilberry is also used to support the mucous membranes of the mouth and throat. Bilberry contains nutrients needed to protect eyes from eyestrain or fatigue, and supports circulation to the eyes. Bilberry tea is administered to alleviate stomach discomfort and soothe the digestive tract. Bilberry PhytoNectar™ uses the finest bilberries, washed, homogenized, and tested to meet the high standards required of VíaVienté™ PhytoNectars™. Blueberries are close cousins of Bilberries and have been traditionally used to support urinary tract health and for poor appetite. Tannins, like all successful tonics, predominate the chemistry of Blueberries. They make up as much as 10% of blueberries. Flavonoids and blue colored anthocyanins account for the beneficial healing properties of blueberries. VíaVienté™ uses Blueberries grown close to the equator that have the highest assays of antioxidant anthycyanins, used for supporting blood vessels, particularly those in the eyes. The PhytoNectar™ of Blueberry is prepared from the finest equatorial blueberries available. Prunes, obtained from dried plums have the highest ORAC value of any fruit. ORAC is a measure of its antioxidant potential. This makes prunes the most potent antioxidant available. Prunes provide regularity to the bowel and are prized for their gentle, cleansing action. VíaVienté™’s prune PhytoNectar™ is made from prunes grown near the equator having the highest ORAC value of any fruit tested by the Tuft’s institute of Nutrition. The Elderberry traditionally has been called “the medicine chest of the common people. Its berries have been used in traditional folk medicine for centuries. The elder also has a rich background of cultural superstitions. In the Middle Ages legends held that the tree was home to witches and that cutting down one would bring on the wrath of those residing in the branches. The Russians and the English believe that elder trees ward off evil spirits and it was considered good luck to plant a tree near your home. Sicilians think that sticks of elder wood can kill serpents and drive away thieves. Egyptians used it to improve the complexion and heal burns. It has a rich history of promoting long life. The rich folklore associated with elderberries is substantiated by science. The berries contain flavonoids which support the soft tissues of the respiratory system, and tannins, especially purple colored anthocyanins that are powerful antioxidants. Other uses of Elderberries include urinary tract and bladder support and as an eye tonic. As with all the PhytoNectar™ used in VíaVienté™, Elderberry PhytoNectar™ uses the finest elderberries, washed, homogenized, and tested to meet the high standards required of VíaVienté™ PhytoNectars™. Noni, the common name for Morinda citrifolia contains polysaccharides and Tannins including flavonoids that support proper joint function and soft tissue health. The active ingredient in Noni is derived from bromelain, a nutrient traditionally used to relieve the aches and pains associated with joint health and indigestion..
Noni fruit PhytoNectar™ conforms to the strictest standards to be used in VíaVienté™. Cranberries have been a folk-remedy for years. As far back as the 1600s, cranberries were thought to help with a long list of ailments and have also been long associated with general urinary tract health. Now science is validating the folklore regarding the wonders of cranberries. Studies suggest that cranberries may also inhibit many types of bacteria from adhering to interior body linings. In addition, cranberries support good gum health because they prevent plaque causing bacteria from colonizing in the gums. Other studies suggest that cranberries may be beneficial to the heart, decrease the recurrence of urinary stones and promote good stomach health. The positive health effects of cranberry are due to its rich content of tannins, both flavonoids, and anthocyanins. To become cranberry PhytoNectar™, each lot of cranberries is carefully homogenized and standardized to the highest levels of these anti-inflammatory, antiseptic, and antioxidant compounds. “An apple a day keeps the doctor away”. Apples have been a source of constitutional strength for centuries. Recently, the Chinese, intent on improving the health of its large population embarked on a campaign to increase the size of their apple crop. They concluded that planting apple trees was the most cost-efficient way to improve their health. VíaVienté™ uses Whole apples to make its PhytoNectar™. Seeds, skin, and pulp are all combined to maximize the healing properties of this important PhytoNectar™. Aloe vera is known as “lily of the desert”, the “plant of immortality”, and the “medicine plant”. The name was derived from the Arabic alloeh meaning “bitter” because of the bitter liquid found in the leaves. As early as 1500 B.C. Egyptians recorded use of the herbal plant in treating burns, infections and parasites. Extensive research has shown that the whole leaf aloe vera juice has a dramatic ability to support the body’s ability to heal wounds, ulcers and burns by putting a protective coating on the affected areas and speeding up the healing rate. Aloe contains slippery glycoproteins and is rich in the secret of all tonics, tannins. The tannins in Aloe have a tonic effect that soothes the digestive tract. Aloe contains at least three anti-inflammatory compounds that are helpful for the stomach, small intestine and colon. A newly discovered compound in aloe, acemannan, is effective for immune system support by supporting increased levels of T-lymphocyte immune cells. Whole leaf aloe vera PhytoNectar™ is useful for gastro-intestinal health, and helps reduce inflammations. What are the unique selling propositions of VíaVienté™? What are the benefits of VíaVienté™? It is a vitalizing healing and constitutional tonic. That means that you will look and feel great when you take it. The beneficial powers include antioxidant and antiaging effects. The ability to help protect against the health challenges of everyday life. It will give you more energy, relief from stress and greater immune system support to face life’s stresses. Dr. Pedersen created the VíaVienté™ formula. He states, “In my twenty plus years as a formulator of nutritional products this is by far my proudest achievement.” Having worked with Craig Keeland for over twelve years, we share many bonds, and one of them has been to share with the world a liquid drink – tonic that will produce a benefit of healing, energy, and to slow down aging. This has been accomplished with VíaVienté™. Mark’s road to becoming one of the world’s leading product formulators began because he was battling a chronic intestinal disorder that could not be controlled by conventional means. This led him to nutrition for survival. While he has formal degrees in Chemistry and Geology from Brigham Young University, he also possesses a Doctorate of Naturepathic Medicine. While developing products at Nature’s Sunshine he wrote his first book (1987) which still to this day is one of the best selling books on nutrition, “Nutritional Herbology”. Later Dr. Pedersen worked at Albion Labs which is the premier mineral company and began combining minerals, herbs, and vitamins to produce synergistic formulas. He is one of only a few in the world who know how the achieve maximum benefits from combining nutrients. Mark is married to Kellie Ann Mangum. They have five healthy children and reside in Utah. VÍAVIENTÉ™ – Great taste, standard potency, proven science, proven quality.